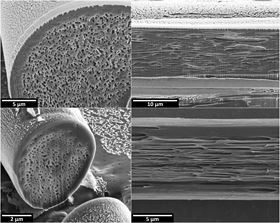 Scanning electron micrographs of man-made fibers emulating the optical properties of comet moth cocoon fibers. Top row: Transverse and longitudinal cross-sections, respectively, of a synthesized fiber made of regenerated silk containing a high density of filamentary air voids. Bottom row: Corresponding images of a PVDF (polyvinylidene difluoride) fiber containing a high density of filamentary voids. Image: Norman Shi and Nanfang Yu/Columbia Engineering. Fabrics made from silkworm fibers have long been treasured for their beautiful luster and refreshing coolness. Researchers at Columbia Engineering have discovered that fibers produced by the caterpillars of a wild silk moth, the Madagascar comet moth (Argema mittrei), are far superior in terms of brilliance and cooling ability. Not only do the comet moth's cocoon fibers have outstanding cooling properties, they also have exceptional capabilities for transmitting light signals and images. Led by Nanfang Yu, associate professor of applied physics, the team characterized the optical properties associated with one-dimensional nanostructures they found in comet moth cocoon fibers. They were so fascinated by the unusual properties of these fibers that they developed a technique to spin artificial fibers that mimic the nanostructures and optical properties of the natural fibers. The study is described in a paper in Light: Science & Application. "The comet moth fibers are the best natural fibrous material to block sunlight we've ever seen. Synthesizing fibers possessing similar optical properties could have important implications for the synthetic fiber industry," said Yu, an expert in nanophotonics. "Another amazing property of these fibers is that they can guide light signals or even transport simple images from one end to the other end of the fiber. This means we might be able to use them as a biocompatible and bioresorbable material for optical signal and image transport in biomedical applications." While individual fibers produced by domesticated silkworms look like solid, transparent cylinders under an optical microscope, the individual thread spun by the comet moth caterpillars has a highly metallic sheen. This is because the comet moth fibers contain a high density of nanoscale filamentary air voids that run along the fibers and cause strong specular (mirror-like) reflection of light. A single fiber with the thickness of a human hair, about 50µm in diameter, reflects more than 70% of visible light. In contrast, for common textiles, including silk fabrics, to reach such level of reflectivity, many layers of transparent fibers have to be combined to produce a total thickness of about 10 times that of a single comet moth fiber. In addition, the high reflectivity of comet moth fibers extends well beyond the visible range into the infrared spectrum – invisible to the human eye but containing about half of the solar power. This, together with the fibers' ability to absorb ultra violet (UV) light, makes them ideal for blocking sunlight, which contains UV, visible and infrared components. The ability of comet moth fibers to guide light is an effect known as transverse Anderson localization, and is a result of the filamentary air voids along the fibers. These air voids cause strong optical scattering in the fiber cross-section, providing sideways confinement of light, but presenting no impediment for light propagation along the fibers. "This form of light guiding – confining light to propagate within the interior of a strand of material with no sideways light leakage – is very different from the one utilized in light transmission through undersea fiber-optic cables, where light confinement is provided by reflection at the boundary between a fiber core and a cladding layer," said Norman Shi, lead author of the paper and a PhD student recently graduated from Yu's lab. "This is the first time transverse Anderson localization has been discovered in a natural materials system. Our finding opens up potential applications in light guiding, image transport and light focusing where biocompatibility is required." Once Yu's team had characterized the comet moth fibers, they set about inventing novel fiber pulling methods that emulate the fiber spinning mechanism of the comet moth caterpillar, in order to create fibers embedded with a high density of particulate or filamentary voids. The researchers achieved a density of voids several times higher than found in the natural fibers, so that a single bioinspired fiber could reflect around 93% of sunlight. The team produced these bioinspired fibers using two materials: a natural material (regenerated silk, i.e., a liquid precursor of silk fibers) and a synthetic polymer (polyvinylidene difluoride). While the former is suitable for applications requiring biocompatibility, the latter is suitable for high throughput production. "The single major difference between our bioinspired fibers and fibers used universally for textiles and apparel is that the bioinspired fibers contain engineered nanostructures, whereas conventional fibers all have a solid core," Yu said. "The capability of structural engineering on the tiny cross-section of a fiber via a high-throughput, high-yield fiber spinning process opens up a new dimension of design – we can infuse completely novel optical and thermodynamic functions into fibers and textiles composed of such fibers. We could transform the synthetic fiber industry!" These bioinspired fibers could be used for making ultra-thin summer clothing with ‘air conditioning’ properties. Just a few layers of the fibers could make a totally opaque textile with a thickness that is just a fraction of a sheet of paper. Yet it wouldn't become translucent when the wearer sweats, which is a common problem with conventional textiles. While sweat reduces the opaqueness of common fabrics by reducing the number of fiber-air interfaces that reflect light, it would not affect the nanoscale air voids embedded in the bioinspired fibers. In addition, ultra-thin apparel made of the ‘porous’ fibers would promote cooling through a combination of sweat evaporation, air flow between the microenvironment of the human body and the exterior, and radiation of body heat to the external environment. "Thus, your clothes could give you the ultimate cooling experience through the collective effect of evaporative, convective and radiative cooling," Yu added. Yu is currently working on finding ways to increase the rate at which such bioinspired nanostructured fibers can be produced. His lab wants to achieve this with minimal modifications to the common practice of industrial fiber pulling. "We don't want to drastically change those gigantic fiber spinning machines in use throughout the industry," said Yu. "Instead we want to introduce clever twists to a few critical steps or components so these machines can produce nanostructured, rather than solid, fibers." Mimicking moths - Photonic Burnished Brass.